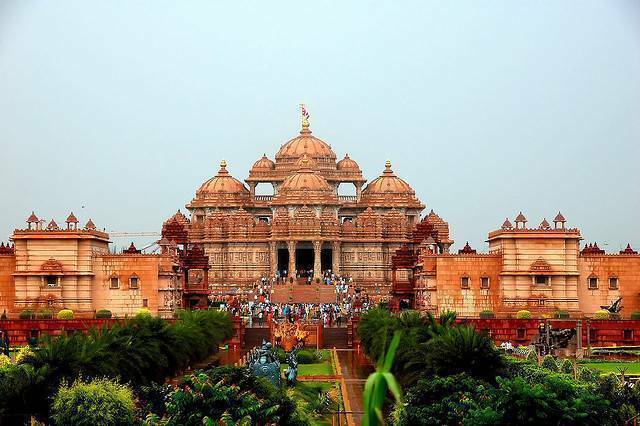 Delhi's Akshardham Temple is dedicated to the Swaminarayan sect of Hinduism. This beautiful and large temple structure constructed without use of steel is situated on the banks of Yamuna river and attracts numerous tourists every day. Temple made of pink stone and white marble has 234 elaborately carved pillar, 9 intricate domes and around 20, 000 statues. There are exhibitions that display the life and culture of Swaminarayan and Indian history. There is also a musical fountain show that is put up during the evenings, boat riding facility in an artificial lake created within the temple premises, a beautiful garden and provides a culturally rich spiritual journey to the visitors.